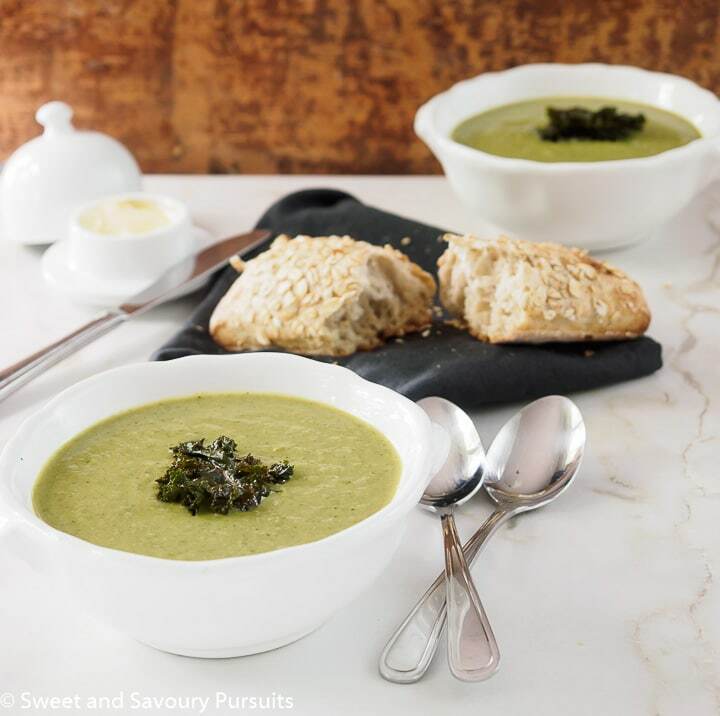 Nutritious, delicious and simple to make this Cauliflower, Kale and Leek Soup is perfect for warming you up on those chilly days. 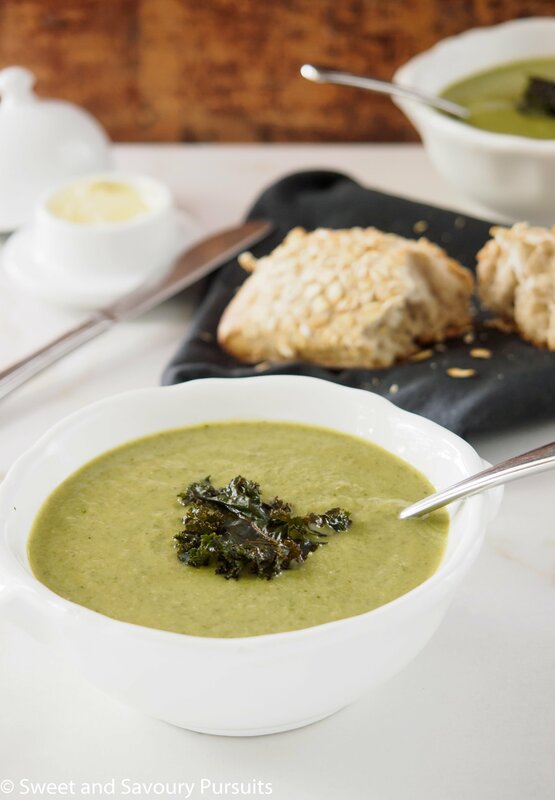 This Cauliflower, Kale and Leek Soup is a healthy soup that is both delicious and easy to make. Cauliflower is great for giving soups a creamy texture without actually having to add any cream to it. 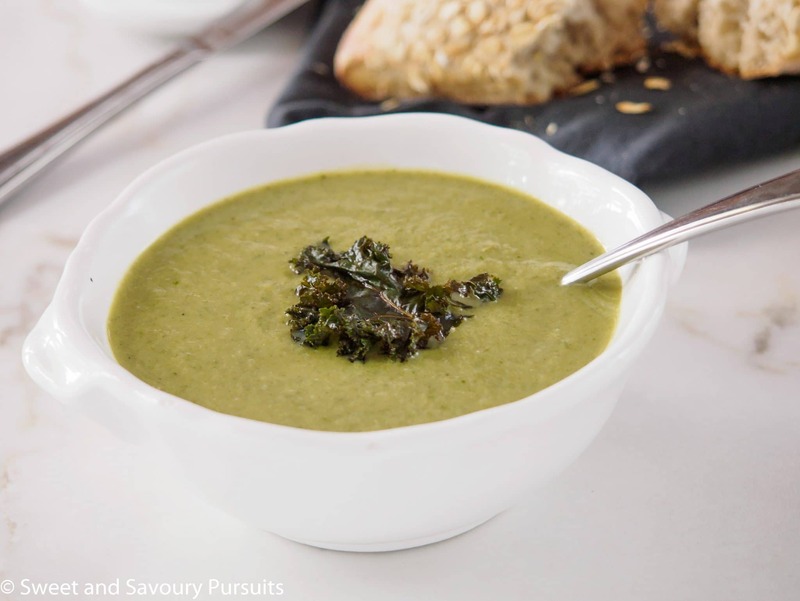 The kale and leeks add so much flavour and the kale gives this soup such a beautiful green colour. Cauliflower and kale are both part of the cruciferous vegetable family which provide us with antioxidants and other fantastic health benefits. If you wanted to make this soup on a weeknight, you could speed things up by prepping the veggies a day or two before. Just wash and chop up your vegetables, and then store everything separately in tupperware in the refrigerator until you’re ready to make the soup. I used boxed chicken broth to make this soup but you can also use vegetable broth if you wanted to keep it vegetarian. I destroyed my blender last winter by putting in liquids that were too hot, so this time I opted to use my handheld blender to blend the soup right in the pot. You could also let the soup cool a bit and purée it in batches in a blender or food processor. Serve this Cauliflower, Kale and Leek Soup with crusty bread and you’ve got a delicious, healthy and light meal. Perfect for warming you up on those chilly days. If you love cauliflower and soup, take a look at my Red Lentil and Cauliflower Soup recipe, you’ll love it! Heat the olive oil and butter in a large pot over medium heat. Add the leeks and celery and cook stirring occasionally until soft, about 6 to 8 minutes. Add the sliced garlic and a pinch of salt and pepper, and cook for 2 minutes more. Add the cauliflower, and pour in the chicken stock. Increase the heat to medium-high and bring the soup to a simmer. Reduce the heat to medium-low and cook for 10 minutes. Stir in the kale, and let simmer for 10 minutes more. Using a handheld blender, blend soup until smooth. Or you can purée the cooled down soup in batches in your blender or food processor. If soup is too thick, thin out using more stock or water. Add more salt and pepper to taste and add nutmeg if using. This looks really yummy! I am looking forward to making it. I love all kinds of soup and this looks so yummy. I love this!! I literally woke up this morning thinking “Hmm, I feel like soup today”. Thank you for the inspiration – I have both cauliflower and leek in the Fridge!!! What a delicious and healthy hearty soup. Served with some crusty bread and this is comfort food. Pinned! This looks like a delicious beautiful creamy soup, just in time for fall. Thanks so much Julie, I’m not sure why but your message ended up in my spam folder, so I didn’t see it till now. Hope you’re having a great weekend! This soup looks like a big bowl of comfort! It looks so creamy – I can’t believe there’s no cream! I love a dish I can totally splurge on without feeling guilty! I know I love that too. This soup doesn’t have a bit of cream in it but it still tastes so good! This looks really delicious! Can’t wait to try it. This looks delicious! What a nice way to get a few extra veggies into your diet too – just what I need! Lovely photos too! Thanks Jessica! I agree plenty of good for you veggies in here. Have a great weekend! this soup looks soooo delicious! Thanks so much Lynz, hope you’re having a great week!